Apply now for 2019's awards! Are you a Supply Chain Champion? The GIB software solutions improve the processes in over 600 companies worldwide and accelerate careers. With measurable success. In order to celebrate this success, GIB has been awarding the GIB SCM Award to special successes since 2012. The winners have earned the award by using GIB software to increase profits, reduce inventory and improve delivery accuracy. Are you a Supply Chain Champion as well? Apply now and with a little luck you will be on the winner's rostrum at the GIB SUCCESS DAYs. Simply download the application documents and get in the game. Steffi Hoppenheit from Knorr-Bremse AG received the SCM AWARD for „Best Idea for Module Expansion“. 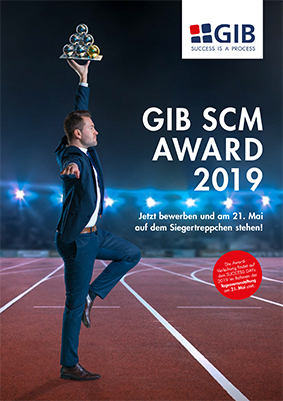 Andreas Gaupp from Multivac happily accepted the GIB SCM AWARD in the category of „Sustainability“. The award for the best GIB Suite Implementation Project went to Hendrik Oldenburg and Michael Wiesner from LTN Servotechnik GmbH. Peter Nickel and Mehmet Kozan from Baier & Schneider received the award for „Best Optimization of Inventories and Readiness for Delivery“. Hugo Hürlimann from Kambly SA brought back the award for “Best Idea for Module Expansion” to his company's headquarters in Switzerland. In 2015, “Best GIB Suite Implementation Project” went to Klaus Albers and Stefan Kusche from apetito AG. Agricultural machine manufacturer Krone has been successfully using the GIB Suite since 2009. Michael Sommerer accepted the award in the “Sustainability” category. Jan Beerwerth took home an award in the category of “Best Idea for Expanding an Existing Module” for Krombacher Brauerei. The award for the best GIB Suite Implementation Project went to Manuela Flury and Stefan Schneider from Schaffner. Markus Maier accepted the award in the category “Best Optimization of Inventories and Readiness for Delivery Within the Past 12 Months” on behalf of J. Wagner GmbH.